[Jesus prayed,] "During my time here, I protected [my disciples] by the power of the name you gave me. I guarded them so that not one was lost, except the one headed for destruction, as the Scriptures foretold." Jesus came to save, to bless, to redeem, and to protect. 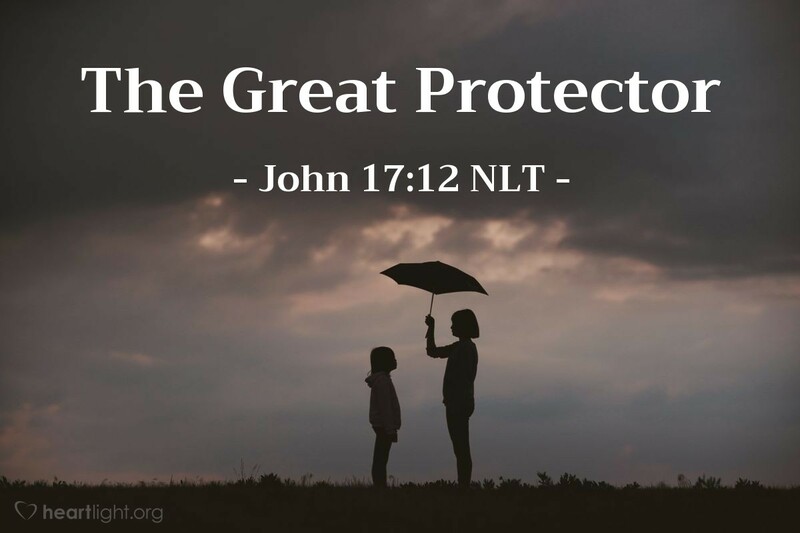 A primary focus of Jesus' last moments with his disciples was protection. He wanted to protect them spiritually from discouragement, so he told them about what was going to happen with him and promised to send the Holy Spirit as the comforter and counselor to help them. He wanted to protect them physically, so he took control of his own arrest (John 18) and made sure that his disciples were not involved with the torturous night and day that followed. All of this meant that he had to bear his impending death, his mockery of a trial, and his agonizing trip to Calvary alone. Why did he do it this way? Because of his love for his own and his desire to protect them. And that, dear friend, is how he cares for you, too! Father, even in my struggles, please help me find Jesus. I know he is there, comforting me and strengthening me through the Holy Spirit and joining me when I meet with other Christians. Please give me courage that does not flag in the face of opposition, ridicule, or pain. Help me see my Lord Jesus and never doubt his desire to bring me safely home to you. I pray this in Jesus' name. Amen.